Wading boots are one of the most important pieces of fly fishing gear an angler owns. The reason for this is simple. Without a good wading boot (or shoe), the angler is as likely to end up swimming with the fish instead of trying to catch them. Worse, without a wading boot, anglers greatly improve the likelihood of visiting a local Montana hospital to fix a broken ankle or leg. Yes, wading boots are that important. If there's one piece of fly fishing gear that anglers should "bite the bullet" and spend money on, it is wading boots. There's several reasons why wading boots are so important. First is safety. The traction provided by wading boots allows anglers to walk among wet rocks and other slippery conditions with relative ease. Second is comfort. Since an angler is likely to wear their wading boots throughout the day, a heavy and ill-fitting wading boot is a recipe for a not-so-pleasant day of fishing. Sore feet and tired legs aren't what fly fishing dream days are made of. Happily, anglers will not need to break the bank to buy a pair of quality wading boots. The price difference between poor quality, ill-fitting and not-very-good draining boots and quality boots that last years and are comfortable is relatively small. In the grand scheme of things, the price difference is immaterial compared to what an angler spends on their fly fishing outfit, flies, accessories and so much more. So, the moral of the story is this. An angler should spend whatever is needed to buy a comfortable fitting and quality wading boot right out of the gate, regardless of skill level. Lightweight - The wading boots should be as lightweight as possible. An angler likely will cover many miles walking in them during the course of a day. Heavy boots = tired legs = miserable day fishing. Find a boot that tips the scales at four pounds or less...and the lighter, the better. Rubber Sole Not Felt - The wading boot should have a rubber sole, not a felt sole. For reasons why anglers should now avoid felt soled wading boots, read this section below. Drains Well - The wading boot must drain well. A poor draining boot weighs a ton and is not fun to walk with and also poses a danger to an anglers safety, too. 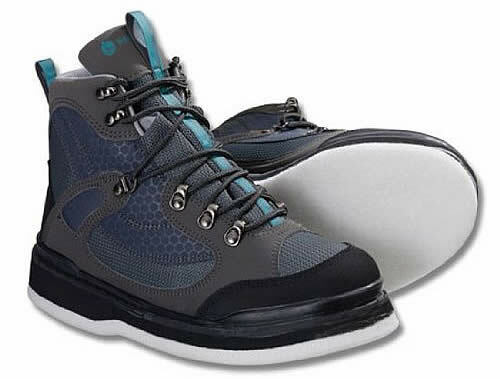 Lightweight Uppers - Look for wading boots that have uppers constructed of synthetic leather or microfiber. This type of upper material is relatively lightweight, durable, drys quickly and remains flexible over time. Laces & Lacing System - Check to see if the boot is easy to lace up (quick lacking like with hiking boots), has durable laces that won't fall apart when wet, and spare laces are readily available (yes, you'll eventually break them regardless of how strong they are). Rock Solid Ankle Support - The boot must provide solid ankle support. By that, I mean that it should be nearly impossible for an angler to "roll over" their ankle. As touched on earlier, wading boots are crucially important yet are one of the gear items that anglers frequently ignore, often to their detriment. Because of this, it is necessary to expand on why wading boots are so important and why anglers should not try to save a few dollars by buying the cheapest pair that happens to show itself. Fly fishing is hardly a dangerous sport. Yet, every year, anglers end up hobbling into a hospital with a sprained or broken ankle due to tumbling into the river unexpectedly. While not all tumbles can be avoided, most falls can be prevented by simply wearing a wading boot that provides solid traction with wet, slippery rocks. The new wading boots on the market today, through the use of new materials and designs in lug patterns, now provide superb traction on slick surfaces. While the wading boot doesn't remove a need for "common sense" by the angler, the superb traction goes a very long ways in preventing slips and slides as an angler works their way up and down the river. Moreover, a quality wading boot will always provide solid ankle support. The importance of solid ankle support can't be understated. It is a given that when an angler walks in a river that they'll encounter loose rocks that will twist and turn unexpectadly. Without solid ankle support, an angler will sooner or later "roll their ankle," leading either to a nasty sprain or worse. Just as importantly, solid ankle support holds the foot steady while walking and standing. And a steady foot (aka...a foot that isn't about to "roll over") means far better balance. And far better balance equates to far less likelihood of slipping on a rock and taking a tumble into the river. So what does all this mean for fishing? Simple. It means that an angler who has quality wading boots is unlikely to take a fall into the river, will maintain better balance while trudging through the river (especially in faster currents), potentially save on doctor bills and, most importantly, have a better day of fishing. Quality Wading Boots = Better Balance = Less Likelihood of Injury = Better Day of Fishing. Now that this article has pounded into the reader the importance of the wading boot, let's explore the different types of wading boots available. Anglers of years past probably harbor a dislike of rubber sole wading boots. And not without justifiable reasons. The rubber sole wading boots of decades ago had poor traction and were well-known for having "issues" with the rubber staying attached to the rest of the boot as time went by. An Orvis Rubber Sole Wading Boot from Fishwest. Note the aggressive tread pattern and screw-in studs. See more wading boots at Fishwest. However, that was then....this is now. Today, rubber sole wading boots are the best type of boot to get. Today's boots - assuming you buy a good boot to begin with - provide superior traction, are well made, durable and surprisingly lightweight. Rubber sole boots are also ideal for anglers who will be walking long distances during a day of fishing. Unlike felt soled boots, rubber soled wading boots work just as well on the land as they do in the water. And perhaps just as importantly, rubber sole wading boots aren't on the verge of being banned by whatever state they happen to fish in. As such, an angler who has a rubber sole wading boot won't have to worry about a very important part of their gear suddenly being outlawed. In terms of pure traction on wet, slimy surfaces, felt wading boots probably still provide the best traction. Yes, I love the traction felt wading boots provide on wet, slippery rocks. While rubber soled boots today provide almost equal traction, in my opinion the traction still isn't "equal" to what a quality pair of felt bottom wading boots provide. This is especially true on "slimy rocks" or when stepping on wet leaves that are stuck to the side of a wet rock. A typical felt wading boot. The bottom of the boot is felt, allowing for great traction on slimy surfaces. Yet, that superior traction comes with a few problems. The first problem is that felt wading boots work poorly "out of the water." If an angler does lots of walking along a river bank, the felt soles that work so well on wet rocks suddenly don't work so well on dry tree trunks, dirt and everything else an angler encounters when slogging alongside a river. The second problem is that the felt on a wading boot wears down quickly, particularly if it used outside the stream. While the felt is replaceable, it is still an annoying expense. Worse, the felt often fails right when an angler needs it to work. Twice now I've had the felt start to separate from my wading boots while fishing, ending what up to that point had been productive days of chasing trout. And then finally, and perhaps the biggest problem of felt wading boots, comes with an exotic name of Aquatic Nuisance Species (ANS). An ANS is just what the name implies...an invasive species that isn't native to the river and which is a nuisance. Scientific research has shown that felt wading boots are one of the ways invasive species end up introduced to a non-native river. The felt on wading boots is very slow to dry and also very absorbent. As such, as anglers travel from river to river during the course of a day, they end up accidentally introducing non-native species to whatever river they travel to next. Because of this, Alaska and several other states have banned the use of felt in wading boots altogether. And in 2011, a bill was introduced in Montana to do the same. That bill failed....for now. However, I suspect it is almost a certainty that in future years felt wading boots will be banned in more states as the scientific research about the invasive species problem gains prominence. How long will this be? Who knows. But why take the chance of buying a wading boot only to have the state you fish in decide to ban their use? Yes, it's true. Water sandals can be used for wade fishing. And I'm guilty of this sinful transgression, too. Are water sandals ideal for wade fishing? Hell no. Truth is, they are dangerous to use and I most definitely do not recommend using them for serious wade fishing (yes, this is a case of "Do as I say and not as I do."). A Keen Newport Water Sandal, available from Amazon. If you want to use a sandal for wade fishing, well...this is the one to get. It isn't a wading boot replacement, but it is better than any other alternatives. Still, water sandals - and by that, I mean a water sandal that provides superb traction on slippery rocks - can be used with relative safety to wade fish in certain conditions. To highlight, I'll show my own uses of them. When I'm out float fishing during summer months, I usually leave the waders at home. Moreover, since I'm float fishing, I don't often need to "fish from shore." And since wearing a pair of big, heavy boots while in my kayak all day isn't real comfortable, I use a pair of water sandals from Keen that provide excellent traction on wet rocks. When I want to fish outside the boat - in particular, along islands - I'll stop the boat and wade fish where the water is very slow moving and very shallow (knee deep or less). To keep my feet warm, I'll usually wear neoprene booties. Provided I limit this type of "wade fishing" to shallow and slow moving water (I do try to find gravel bars to do this type of fishing from), I've found that I can wade fish using this method with few problems beyond having to pluck out rocks that work their way between the sandal and my foot (which is admittedly an often painful irritation). Anyways, water sandals can work for wade fishing. But never wade fish with them in deep water or fast moving water. Instead, use them where the water is shallow, very slow moving (or better yet, stagnant) and where the river bottom is consistent (such as a gravel bar). If you decide to try using water sandals to wade fish, be absolutely sure that the sandals fit your foot snugly. The sandals can not move and squirm around the foot. If the sandals move (such as flip flops), even in shallow water you'll be inviting problems to find you. Moreover, most sandals are not designed to provide good traction on slippery surfaces. Because of this, you need to buy a water sandal that has been designed specifically to provide traction on wet, slippery surfaces. Lastly, be sure to buy a sandal that has a "closed toe." The reason for this is to prevent a "stubbed toe" or peeled off toenail due to unpleasant encounters with submerged rocks or obstructions. Yes, I learned this particular lesson the painful way. One recommendation on a water sandal to use is a Keen Newport Sandal. 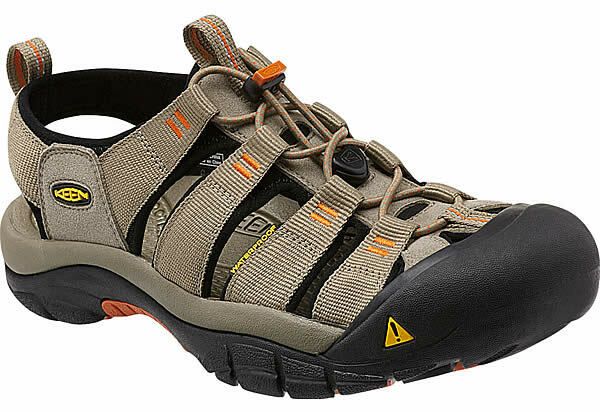 Teva also has several quality Closed Toe Water Sandals that work well for wade fishing, too. When shopping around for wading boots, anglers should always strive for lightweight. Lightweight = Comfortable in the world of wading boots. Secondly, spend whatever you need to spend to buy a comfortable pair of boots. After all, you'll be wearing them all day long. Uncomfortable boots will, without fail, lead to an unpleasant day of fishing. And lastly, I'll strongly recommend - again - that all anglers avoid buying felt soled wading boots. In terms of brands of boots to buy, I love the wading boots made by Patagonia. 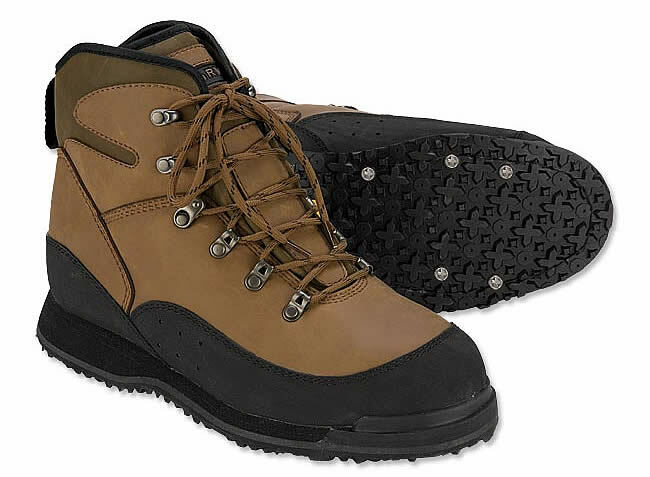 Their boots are ultralight, durable and have very "sticky" rubber sole tread patterns. Other quality boots are made by Orvis, Cabela's , Redington & Simms. Offline, any quality fly shop should have a decent selection of wading boots although at times certain sizes will be difficult to find. Additionally, the Cabela's retail stores are excellent places to shop for wading boots. 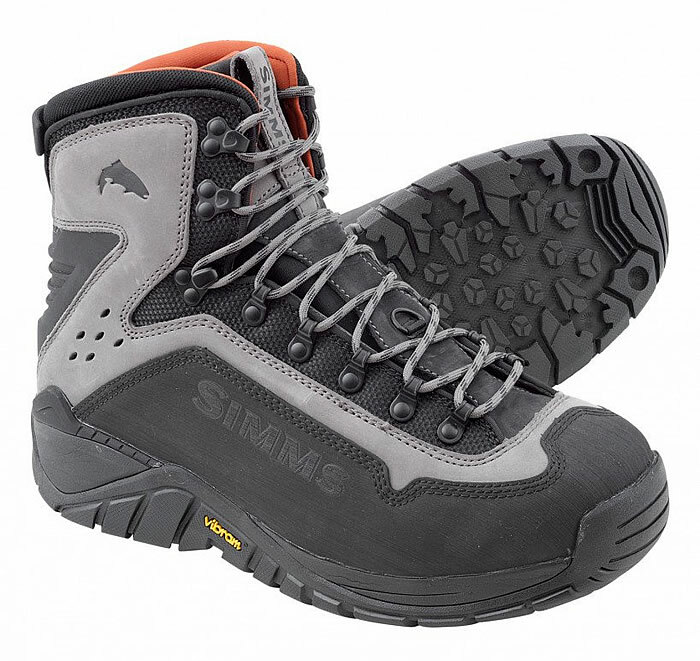 Simms - Manufacturers top quality wading boots. Based in Montana. Patagonia- Has their own brand of very high quality wading boots that are lightweight, durable and "sticky" on slippery rocks. Fishwest - Fishwest has a huge selection of wading boots at great prices. Include those form Orvis, Simms, Redington and others. Cabela's - Cabela's sells both their own brand of quality wading boots, along with boots manufactured by Simms, Redington and several other brands. Front Range Angler - Sells high quality fly fishing gear, including wading boots. The Rivers Edge - A Bozeman fly shop that also has an online store and sells quality wading boots.